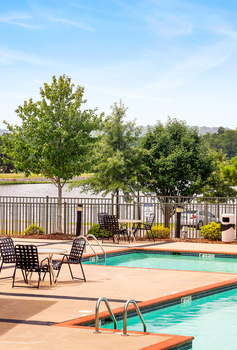 Welcome to an address for those who appreciate an exquisite and comfortable quality of life, The Parc at Maumelle Apartment Homes. This premier elegant apartment community is an oasis designed as a relaxed, quiet residential enclave, offering stunning views and within walking distance of City Park. Select a luxurious apartment residence that will showcase extraordinary amenities, choose a new way of life, and relax in a community where features and services are superlative examples of life at its best. Take advantage of our prime location and enjoy a variety of shopping venues, restaurants and local area conveniences. TEXT Maumelle to 47464 anytime to get information on your phone! The Surroundings Controlled Access Entry, Garage parking with remote access, Resort-style pool, Fitness center, Business center, Lakeviews, Wooded Greenbelt area. The Conveniences High speed DSL. The Amenities Professional, caring Management and Service staff, Pet friendly surrounding, Community Clothes care center, Resident Activities. The Luxuries Large windows, huge walk-in closets, gorgeous lake views.